Dennie Morgan folds are seen in which of the following? Atopic dermatitis is a chronic and relapsing inflammatory skin disorder characterized by itching and inflamed skin that is triggered by the interplay of genetic, immunologic, and environmental factors. Dennie-Morgan fold are a characteristic double fold that extends from the inner to the outer canthus of the lower eyelid. 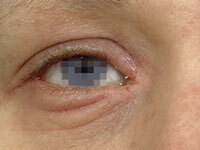 “Allergic shinners” refers to a darkened, violaceous,or tan coloring in the periorbital areas. Along with Dennie-Morgan lines, this dark coloring may be an instant clue to atopy. Topical steroids and emollients have been proven to work for Atopic Dermatitis and are the mainstay of treatment. Image Source :The above image is chosen and displayed from the web. This image do not belong to Gate To Medicine. The author is the responsible owner of the image. We believe that this image is helpful for your learning. Todays Facebook Winner is Navjot Kaur, receiving a FREE Mock Test from GateToMedicine. You need to send us your email id to customercare@gatetomedicine.com. Congratulations!